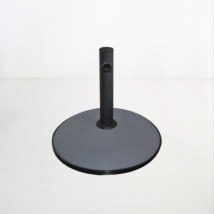 Get the perfect stand for your outdoor umbrella with our fantastic range of Umbrella Stands! 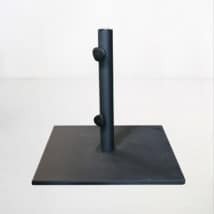 Whether you need movable or fixed, slim or weighted, we have a wonderful collection of umbrella stands that gives you options for your outdoor furniture area. 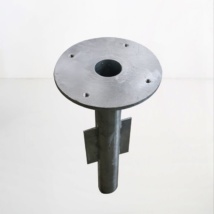 You can’t say yes to a Cantilever Umbrella without the addition of one of our fabulous granite stone bases. 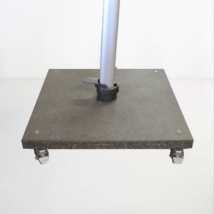 On wheels, with locks, these bases allow you to move your heavy duty Cantilever around your space with ease, and lock it in place so you can remain careless and fancy free! Perhaps you’re purchasing a classic Sunbrella Umbrella for use over your café table? 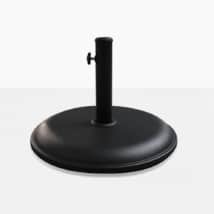 A simple Concrete Round Umbrella Base will give you security of the umbrella, as well as being easy to move and pleasing to the eye. 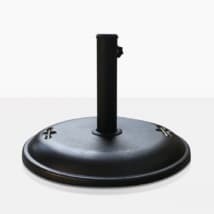 With inserts that adjust to the size of your umbrella, this is the satisfying choice for your umbrella needs. After a super heavy duty base? 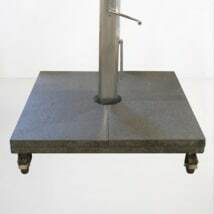 Our Sienna Granite Base is an amazing 80 pounds, and still gives off a sophisticated appearance. 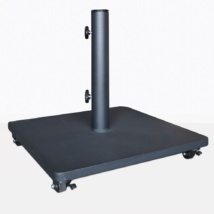 Gone are the days when an umbrella base was only functional! 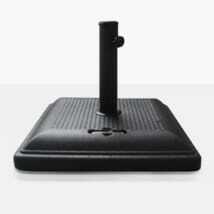 Our bases are smart, sleek and solid! 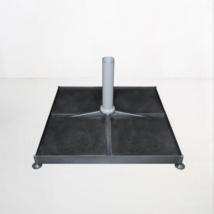 These bases are perfect for our incredible range of umbrellas – whether you are opting for a magnificent Cantilever Umbrella, a huge Sunbrella© round or square, or the classic Market Umbrella, we like to keep you covered in style and sophistication! Teak Warehouse has a huge array of incredible garden furniture, alongside our umbrellas and bases, we have an amazing collection of deep seating, sectionals, dining tables and chairs, loungers and bar furniture. We are proud of bring you the best quality at wholesale prices. Teak Warehouse assembles in store and ships to you direct! Our wholesale prices mean that you are getting the best outdoor furniture at terrific prices. Call our free phone number (800) 343-7707 to find out more!